This morning I discovered that my email account at Cardiff University has been disabled. Obviously the IT Services folk there don’t hang about when somebody leaves! I did get a couple of warnings that this was going to happen, but didn’t expect it quite so soon. The withdrawal of access to IT services at Cardiff seems a bit abrupt, but I suppose that’s just the policy these days. My employment there has terminated so I don’t think it’s unreasonable that they shut down my email.I guess they just don’t go in for long goodbyes! Anyway, I know I haven’t always been very good at replying to email recently, but if you email me at Cardiff from now on then I really can’t reply. I can’t even read your message! This also reminds me that it’s been two years since I left my job as Head of Mathematical and Physical Sciences at Sussex University. I’ve only been back to Brighton once since I left that position. I thought I might have a bit more time to visit there after moving onto a part-time contract at Cardiff, but that didn’t happen. I was very tearful on my last day at Sussex, and can remember vividly how I felt walking down the steps from the Pevensey building for the last time. Still, it’s not a good idea to look back too often.The old School is in good hands, and I’m sure is going from strength to strength. One great thing that has happened since I left Sussex is that the University has become an official partner of Brighton & Hove Pride, which is taking place this weekend. Best wishes to everyone taking part in the parade and associated festivities! The two years since then have not turned out at all the way I planned when I left MPS: I had a three-year part-time contract at Cardiff, after which I planned to retire (in Cardiff). 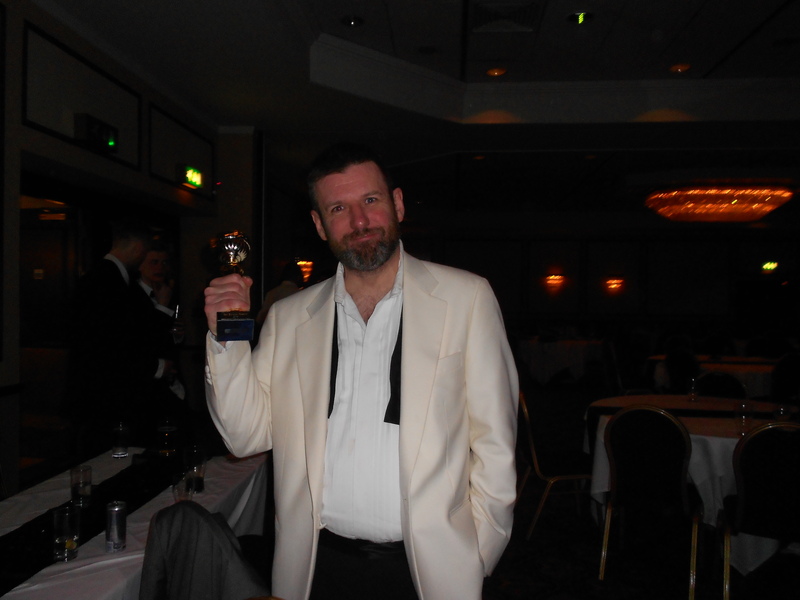 Now, two years on, I’m not retired nor am I in Cardiff, but living and working in another country. After the annual last-minute rush to file my tax return by the deadline (which is midnight today, 31st January), I can now relax not only because the job is finished, but also because it confirms that I am due a rebate (as indeed I was last year). Anyway, thinking about the 31st January deadline made me remember that it was precisely four years ago, on 31st January 2013, that I left Cardiff University to take up a post at the University of Sussex. On that occasion I had to rush to finish marking a big stack of exams and finish packing the books in my office before signing the work of art I had left on my whiteboard and heading off. I started at Sussex the following day. I didn’t think then that in four years I would be back in Cardiff, but then I didn’t think a lot of things would happen that have happened in that time. 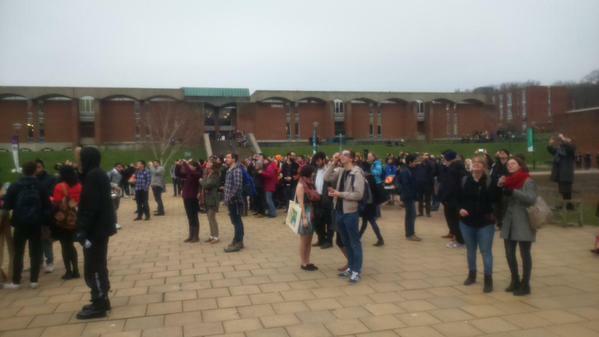 I don’t regret my decision to resign, but I do find myself from time to time wondering how things are going back at Sussex and how things might be now had I decided to stay there. I’ve been so busy I’ve only been back once to Brighton since I left last summer. I must put that right. Perhaps I’ll have a holiday there in the spring. In fact the removals people caught me on the hop, as they said they would phone me about an hour before they were due to arrive but didn’t do so. I was quite surprised to see all the boxes already there when I came in on Monday! I was planning to have all this delivered a while ago to my house, because I didn’t think I was going to be given an office big enough to accommodate much of it. But then I had to delay the removal because my visit to hospital was put back so I wouldn’t have been able to receive it. Then I found out I had plenty of space at the University so I decided to have it all moved here. I’ll be sharing this space with other members of the Data Innovation Research Institute, but for the time being I’m here on my own. The books make it look a bit more “lived-in” than it did when I arrived, though the mini-bar still hasn’t arrived yet. It’s actually about four years since I was appointed to my previous job at Sussex; I moved there from Cardiff in early 2013. It’s a bit strange being back. I didn’t imagine when I started at Sussex that I would be returning relatively soon, but then I didn’t imagine a lot of the things that would lead to my resignation. From what I’ve heard, many of those things have been getting even worse since I left. I think I’ll keep a discussion of all that to myself, though, at least until I write my memoirs! 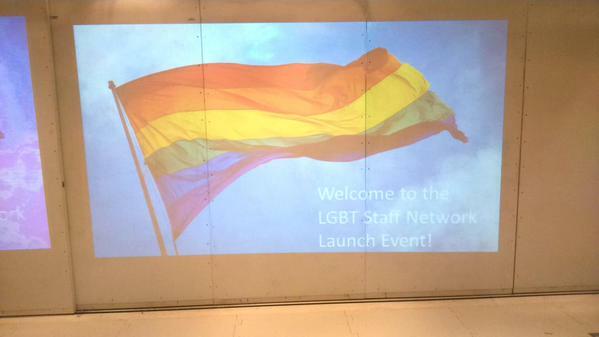 As promised, last night saw the launch of the new Sussex University staff LGBT network. I was quite nervous ahead of the event, unsure of how it would go. In the end most of the people who said they would come did so, 25 people or thereabouts. The mailing list is over 50, but this is a busy time of year so there were quite a few who couldn’t come last night. In fact if there had been many more people it might have made it more difficult for people to have their opinions heard. 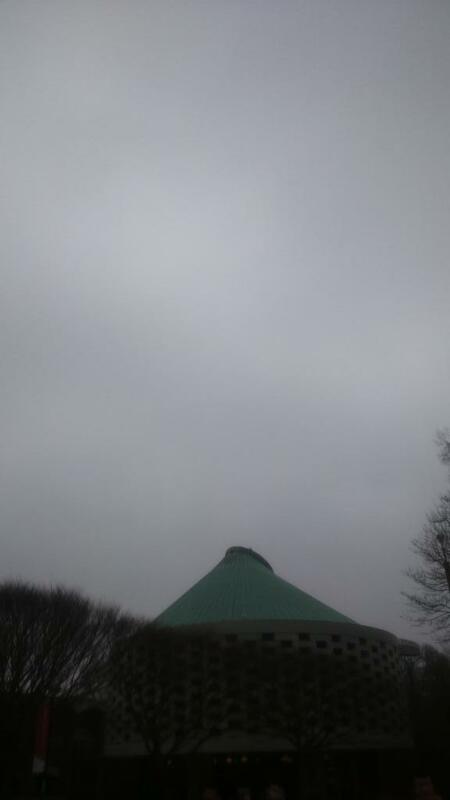 That Was The Eclipse That Was..
It’s been an astronomical and meteorological rollercoaster of a morning. When I woke up at 6am this morning, the Sun was just rising. There was hazy cloud and there seemed to be every chance that it would break up to allowing viewing of today’s partial solar eclipse. Unfortunately, however, the cloud thickened rather than breaking up so I abandoned my plan to watch from the seafront and headed up to the University of Sussex campus at Falmer. Being higher up and a few miles inland, the weather is often clearer in Falmer than in Brighton. Unfortunately it was even murkier when I got here, so I assumed I was in for a disappointing morning. Neverthe less I did join the large gathering in Library Square to experience the event. First contact between the Moon and the Sun happened at about 8.30, but the cloud cover was total at that point so nothing was visible. It did get gradually darker, but this happened slowly enough for eyes to adapt to the dark so it wasn’t all that noticeable to us humans. The birds on campus certainly noticed, however, and began to perform display roosting behaviour thinking it was evening. It also got really very cold. Around 9.30 the coverage of the Sun by the Moon was about its maximum – 85% or so – but everything was still enshrouded in cloud. The crowd waited patiently in the gloom. It was a very British experience, a large group of people sharing their sense of collective disappointment in appropriately stoical fashion. Gradually the wind seemed to increase, pushing the clouds over more quickly and causing them to break up. 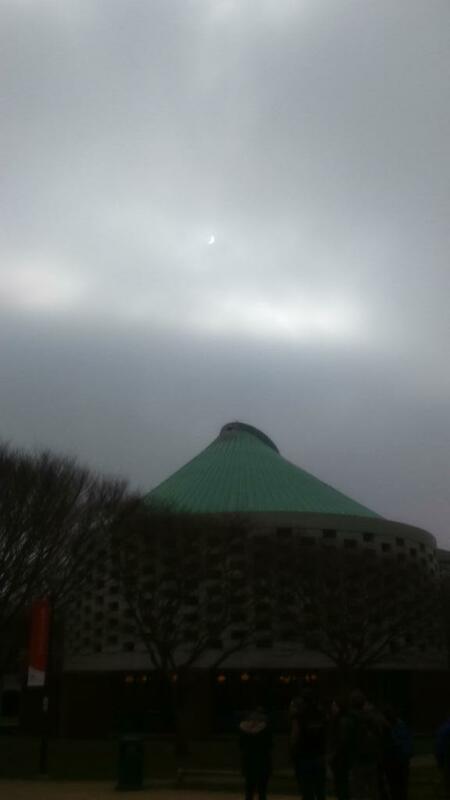 Then, suddenly, a small gap in the cloud opened up and there was the eclipse. For about a second. It may have been only a moment, but it generated a huge cheer which, I should add, wasn’t entirely ironic. The breaking up of the clouds continued and we were treated to several good views of the main event. It was definitely worth it. 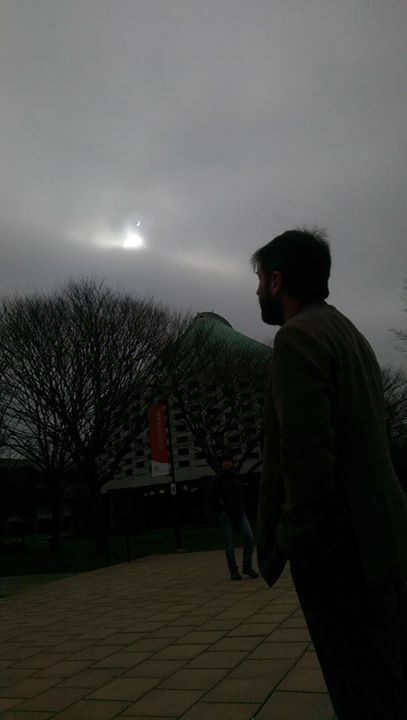 And here’s a rather nice picture from John Sander of the International Office at Sussex University, showing yours truly during the final stages of the eclipse..
I’ll add more pictures as I find them. Please feel free to share your comments and observations via the appropriate box! It’s another open day at the University of Sussex so I’m on campus again to help out as best I can, although I have to admit that all the hard work is being done by others! It’s been extremely busy so far; in fact, I’m told that about 6000 visitors are on campus today. This a good sign for the forthcoming admissions round, probably buoyed by the improved position of the University of Sussex in the latest set of league tables and in excellent employment prospects for graduates. 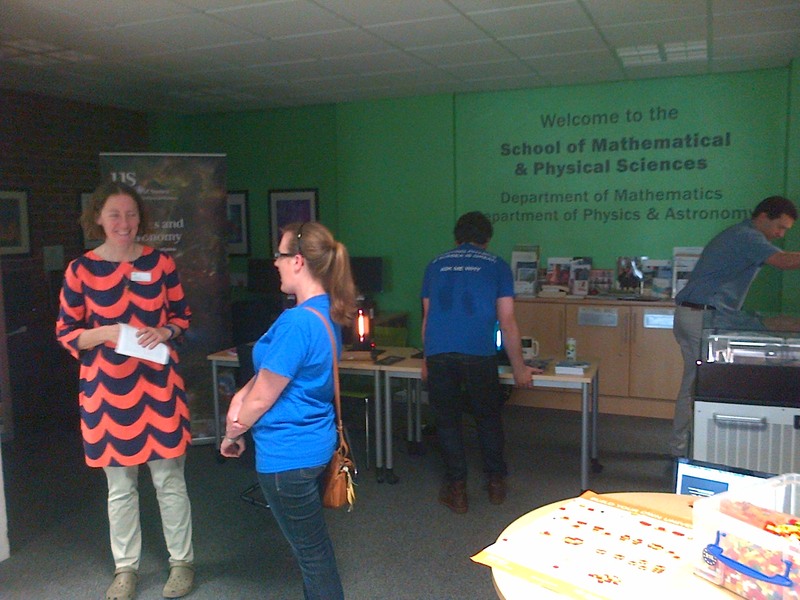 All morning we’ve had a steady stream of visitors to the School of Mathematical and Physical Sciences (which comprises both Departments mentioned above). While I’m at it let me just give a special mention to Darren Baskill’s Outreach Team (seen in the team photograph below). They have had absolutely amazing year, running a huge range of events and activities that have reached a staggering 14,000 people of all ages (including 12,000 of school age). Anyway, I think I’ll toddle off and see if I can sit in on one of today’s lectures. It’s about time I learned something. 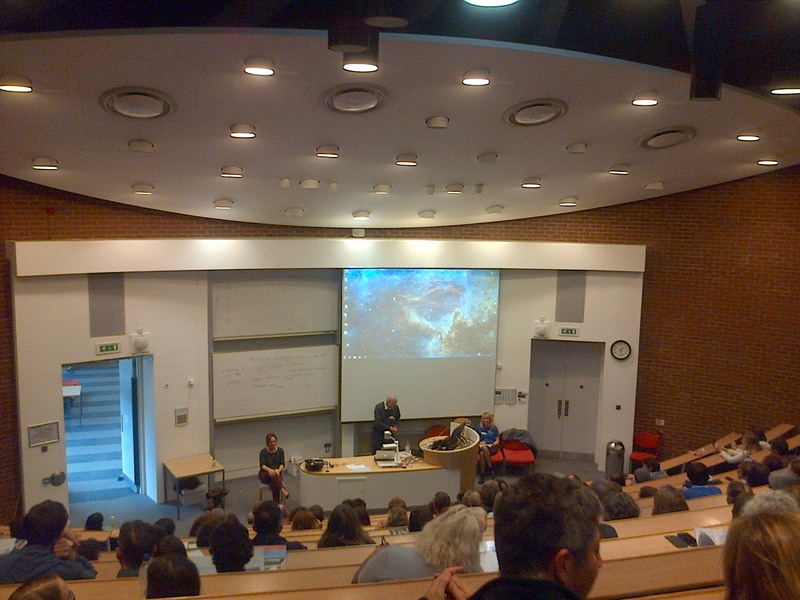 UPDATE: Here is Mark Hindmarsh about to get started on his lecture. 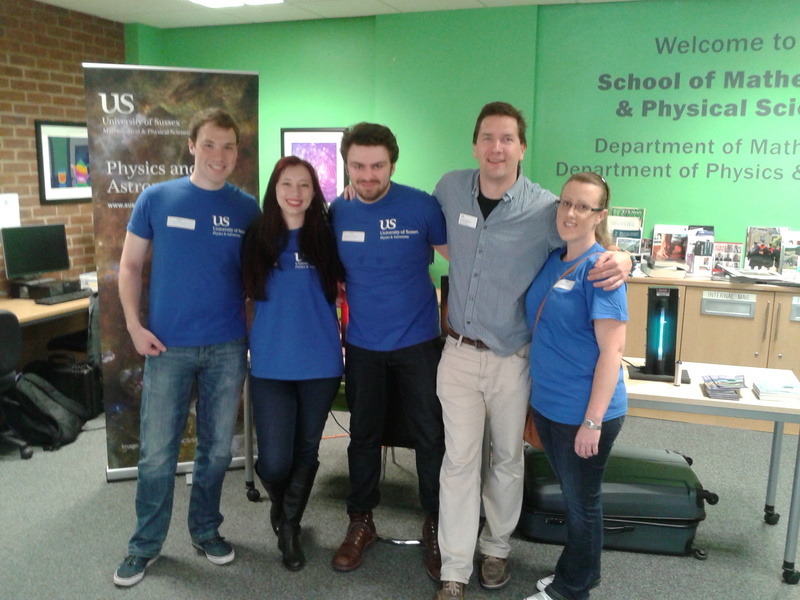 I’ve worked in some good physics departments in my time, but the Department of Sussex is completely unique both for the level of support it offers students and the fact that so many of the undergraduates are so highly motivated. And, yes, I did mean every word of that. 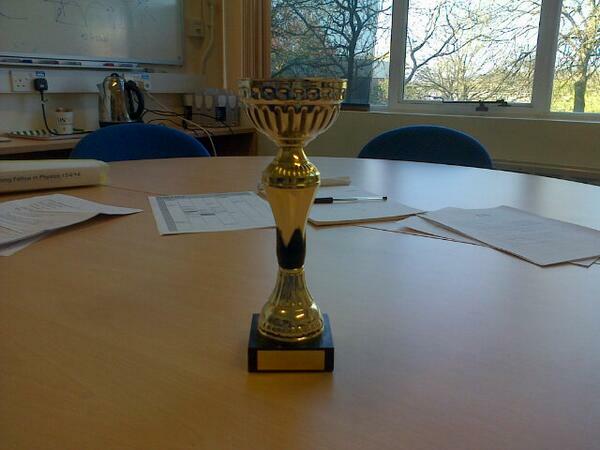 Anyway, I’d like to thank everyone who voted for me, although I’m still not at all sure what “Best Expressed Research” actually means nor do I know what I did in particular to deserve the award. Not that any of that really matters. 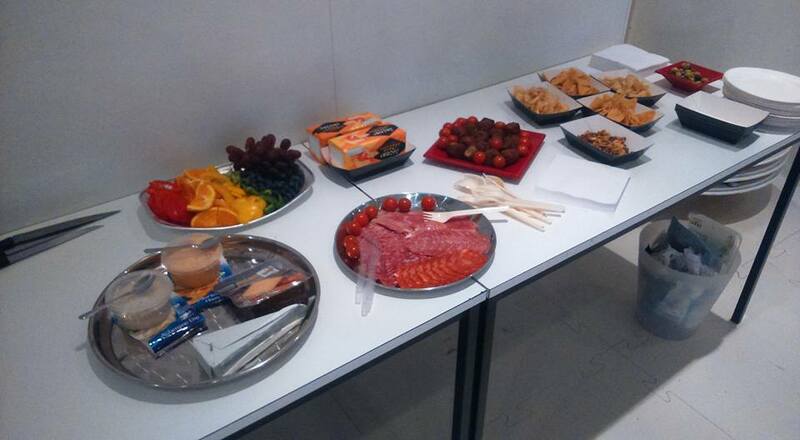 It’s honour enough to be working in a Department that’s part of a School where there’s such a wonderful friendly and cooperative atmosphere between staff and students. 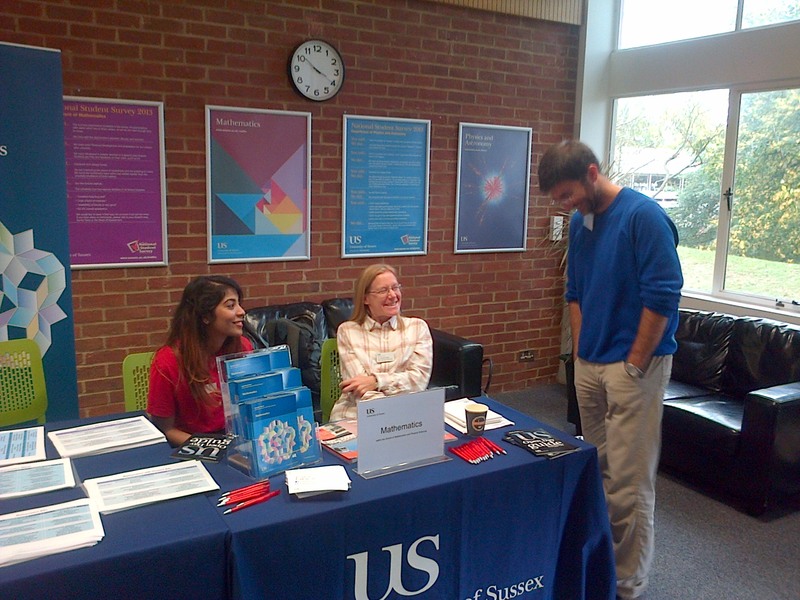 I’ve worked in some good physics departments in my time, but the Department of Sussex is completely unique both for the level of support it offers students and the fact that so many of the undergraduates are so highly motivated. Maybe that’s at least partly because there is such a close link between our teaching and research across the Department. Some people think – and some universities would have them think – that research-led teaching only happens in Russell Group institutions. In reality there’s plenty of evidence that, at least in Physics, Sussex does research-led teaching better than any of the Russell group. Amid all the administrative jobs I have to do these days the opportunity to do a bit of teaching every now and then is the only chance I have of staying even approximately sane. 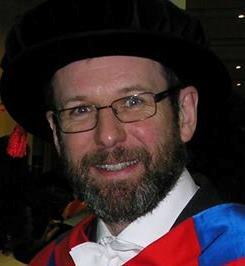 I’m not sure how many other Heads of School at Sussex University do teaching – I’m told my predecessor in the School of Mathematical and Physical Sciences didn’t do any – but the day I have to stop teaching is the day I’ll retire. Teaching students who want to learn is much more than mere waged labour – it’s one of the most rewarding ways there is of spending your time.